Worth a review … these people are an important part of the fakery, even if they are real human beings. Classic Crisis Acting Compulation – 911 – SH – Arizona – Asiana flight 214 – YouTube. This entry was posted in Recommendations, Video on October 22, 2013 by ab. This entry was posted in Entertainment Idolotry, Recommendations, Video on October 22, 2013 by ab. Just his birthday is enough to qualify him to lead the DHS. The DHS is broken into 22 divisions and oversees 240,000 employees. All born from a phony story back on 9/11/2001. This entry was posted in 9/11 on October 22, 2013 by ab. This entry was posted in Psyops, Recommendations, Sandy Hook Hoax, Video on October 22, 2013 by ab. Hero’ teacher trying to protect students one of two dead in Nevada school shooting, police say | National Post. 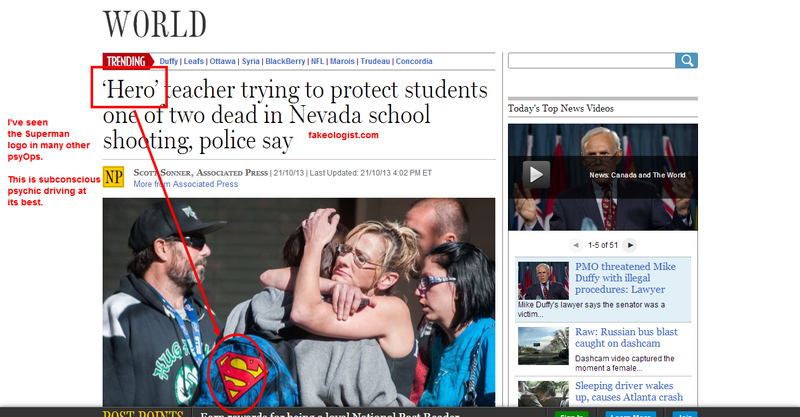 This entry was posted in Deception techniques, Psyops and tagged nevada school shooting hoax on October 22, 2013 by ab. TTC worker Celso Machado’s last-second leap through the air was the only thing that saved him from certain death under an RT-4 work train last fall, according to a newly-released TTC report analyzing the Sept. 12, 2012 incident. Mr. Machado’s coworker, Road Master Peter Pavlovski, was not so lucky. The 22-year TTC veteran was struck head-on by the train and pronounced dead at the scene. His was the first worker death on the Toronto subway network since 2007. Both men had been conducting a visual inspection of a Yonge-University line rail bridge running atop Highway 401 when, at 4:44 a.m., they were hit by a work car. A detailed 39-page report by the transit commission attributes the crash to a tragic confluence of seemingly minor errors, including a distracted driver, the lack of a watchperson, dim train headlights and an overarching culture of TTC maintenance workers looking to “improve productivity” by shirking track-level safety rules. As the TTC network ages and expands, off-hours maintenance workers are increasingly in “a chronic race against time to complete work within a short window of opportunity at night,” read the report. As a result, many workers had taken to making “quick inspections on unprotected track,” relying on nothing more than their wits to survive the occasional passing work car. The report noted that before setting out onto the railbridge, Mr. Machado and Mr. Pavlovski had failed to radio in a “walking inspection request” as required. Thus, their presence on the tracks was unknown to dispatchers. Investigators also pointed to inattentiveness on the part of the RT-4 driver, surmising that he was distracted by a cab full of other crew members, none of whom were expected to serve as lookouts. The RT-4 driver was only 700 feet away when he stated that “it looked like there was something there,” according to the report. At 4:44 a.m., Mr. Machado and Mr. Pavlovski were standing directly in the middle of the tracks when the RT-4 bore down on them. It is suspected that the glare from nearby streetlights stopped them from spotting the car’s headlights in time. Mr. Machado “jumped with the slimmest of margins to save his life” but was still nicked by the car, suffering severe bruises to his lower body and lacerations to his head that required 20 staples. The driver of the work train went into a cardiac episode and, the report noted, the other crew members in the cab suffered psychological trauma. According to one of the report’s attached appendix, TTC management has already begun overhauling its safety procedures. Starting in January, all TTC work vehicles were fitted with extra-bright LED headlights. As a temporary measure, track-level crews are now required to appoint a “dedicated watchperson,” and TTC overseers are working to streamline the procedure by which workers radio in “walking inspections” so that they will be more readily adopted by time-crunched crews. via Last-second leap was all that saved subway track worker from certain death, TTC says | National Post. Minor media hoaxes/psyops are the same as their big brothers, that is about fear and money. Sometimes, they’re meant to scare the politicians into spending more tax money (or giving them the excuse to do so) to solve the problem. It appears this may be the case here. How many minor psyOps are going down in your area? I’m really surprised at what a hot-bed of fakery Toronto is, happening all this time while I was soaking it in as real for years. Today is 10/22. Let’s see what the rest of the day brings us. This entry was posted in Magic numbers, Psyops and tagged ttc track hoax on October 22, 2013 by ab.